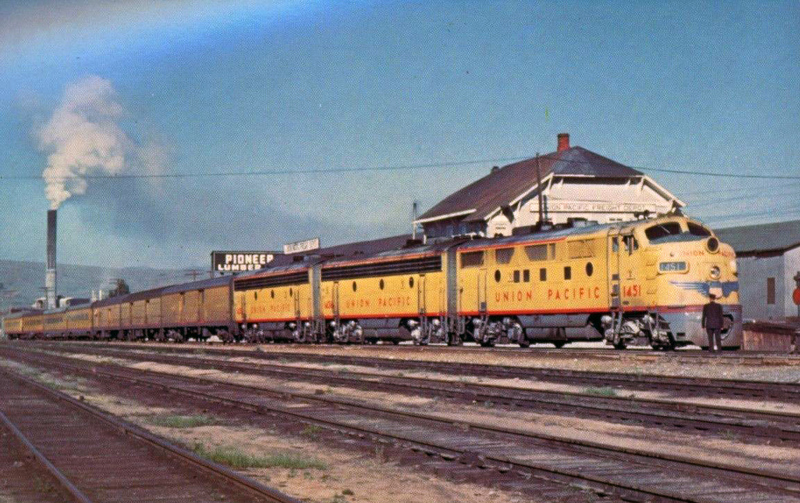 The Union Pacific is long remembered for fielding an impressive passenger fleet during the 20th century that always provided top-level service. If there was ever what one would consider a secondary run on the railroad the Butte Special would fit that description. 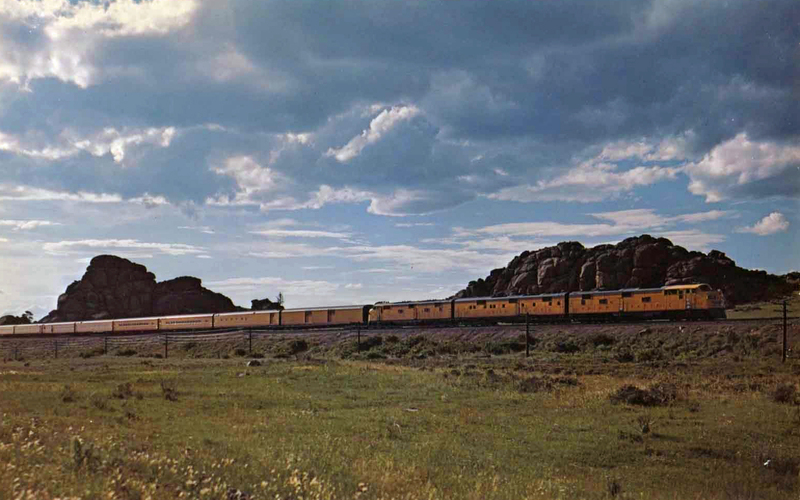 This train operated as a regional connecting Salt Lake City and Butte, Montana along UP's Montana Division where it connected with the Northern Pacific and Milwaukee Road. Once a heavyweight it later fielded streamlining and offered quite an array of amenities, providing one of the last vestiges of Pullman service meals anywhere in the country. During the 1960s UP attempted to cancel the train with little success and it continued running quietly until the start of Amtrak in 1971. The Union Pacific's celebrated array of streamliners are still widely talked about today. Who could forget the opulent City fleet, the Portland Rose, Forty-Niner, or the Challenger? The Butte Special was not as well known as these but true to the railroad's form it blossomed into a fine operation. The Union Pacific reached southwestern Montana through a predecessor known as the Utah Northern Railroad. This narrow-gauge system had been promoted by Mormon interests but failed after a financial panic during the 1870s. It was reorganized by the UP as the Utah & Northern Railway during April of 1878 and completed to Butte (via Pocatello, Idaho) by December of 1881. The line was then standard-gauged six years later in 1887 and became a part of UP's Oregon Short Line & Utah Northern Railway subsidiary in 1889. About ten years later a branch to reach the Yellowstone National Park was completed in 1908. Eventually, this section of the Union Pacific system was known wholly as its Montana Division. Passenger service on the route to Butte commenced soon after and a train known as the Butte Special became the line's top service (and the only UP train operating on a north-south routing); it connected Salt Lake City/Ogden with Butte via Pocatello and also provided summertime service to Yellowstone. Although listed in UP's timetable as a named train, the Yellowstone Special, this "train" actually was only an additional section of coaches and sleepers provided on either the Butte Special, Portland Rose, or the City of Portland. The Butte Special best remembered today took form during roughly the 1920s. After this time one could see a variety of large steamers pulling the train although it most often used Class MT Mountains. 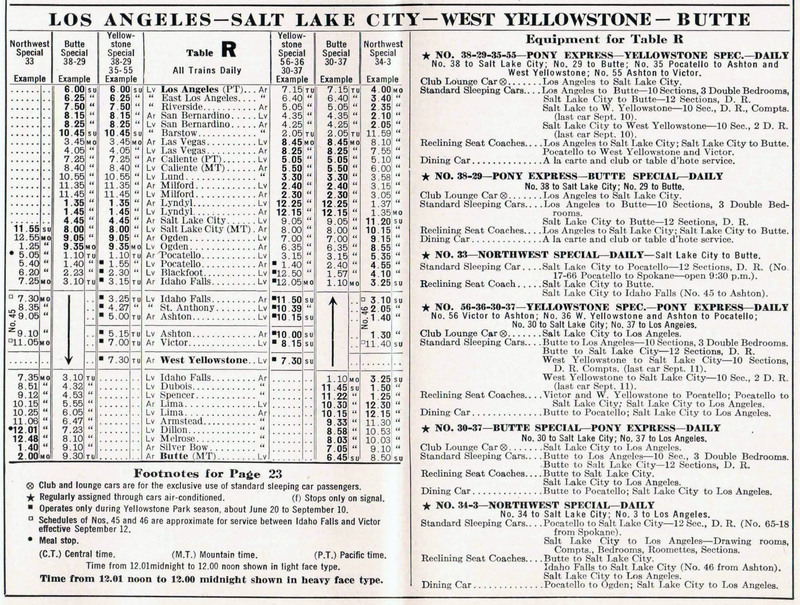 Officially it was listed as #29 (northbound) and #30 (southbound) with a typical consist including several mail/express head end cars (upwards of a half-dozen), a Railway Post Office (RPO), two or three reclining seat coaches, a cafe-lounge, and up to three sleepers (one serving Butte to Salt Lake, another running through to Los Angeles, and a connecting Southern Pacific section via Oakland). When the streamliner era hit the industry, spurred by none other than Union Pacific' own M-10000 launched in February of 1934 the Butte Special began fielding rebuilt heavyweight cars with semi-streamlining. During the 1940s the equipment also wore UP's brief two-grey passenger livery, a simple but elegant scheme that also adorned steam locomotives. When the railroad began a concentrated effort to dieselize its motive power fleet after World War II it had a batch of F3s, delivered between 1947 and 1949, equipped for passenger service (steam generators). Later rebuilt into F7 specifications these normally-assigned freight locomotives continued to pull the Special until the railroad acquired batches of true passenger power rom the early 1950s through 1964 in the form of Electro-Motive E8s and E9s (Fs, however, could still be found heading the train through the 1960s). 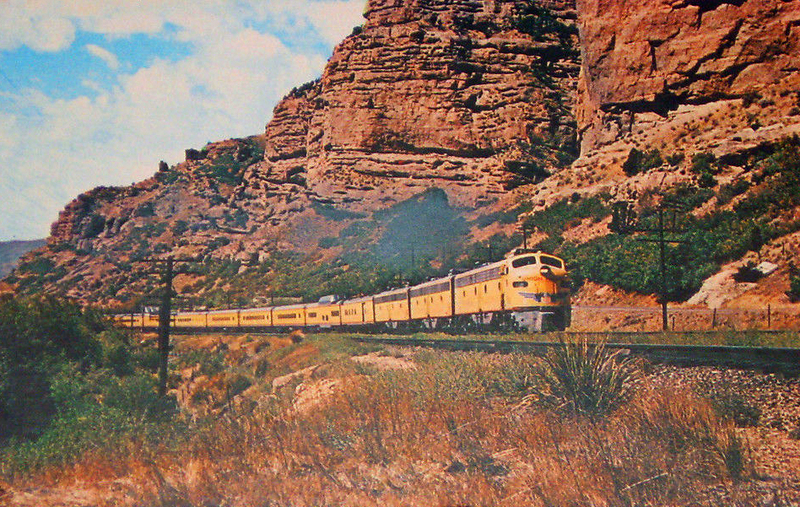 It was during this time that the train was clad in Union Pacific's classic Armour yellow and gray passenger scheme thanks to these new diesels along with the lightweight equipment. It is fascinating that for a train serving a town of no greater than 50,000 residents (Butte) it offered an impressive level of conveniences. Its most impressive feature was a 6-6-4 American View sleeper that had two sections converted to offer light meals provided through Pullman. While only a dinette service this unique setup is still talked about today for those lucky enough to have experienced it. Even as patronage declined during the 1960s Union Pacific kept the train immaculate with all-matching, clean equipment. In 1960 it stopped providing direct service to West Yellowstone and in 1965 discontinued all rail service to the national park. The major blow came in 1967 when the train lost its lucrative U.S. mail contract and was subsequently curtailed to thrice weekly only. In its final years the Special was listed as #35 (northbound running on Thursday, Saturday, and Monday) and #36 (southbound running on Friday, Sunday, and Tuesday). The Union Pacific petitioned the Interstate Commerce Commission to cancel the train after this time but had little success in doing so. As such, the train continued on until Amtrak normally carrying a baggage, two reclining seat coaches, and that unique 6-6-4 dinette/sleeper, the last of its kind in the country to offer Pullman meal service. Through the end, in typical UP fashion the Butte Special remained an all-matching train with an E9A or E8A for power and the four-car consist mentioned above. Perhaps only the Santa Fe equaled the UP in this capacity as both railroads simply did not let services slip despite mounting losses right until Amtrak took over.